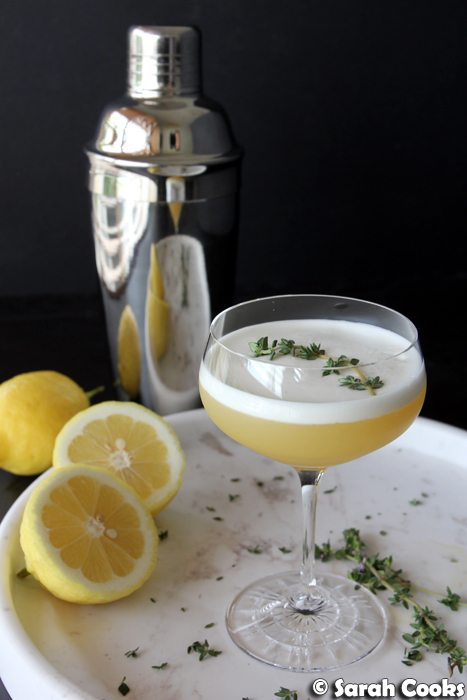 Today's recipe is a refreshing gin sour, with the bracing tartness of lemon, a herbal hint of thyme, and a frothy frothy egg-white foam. It's easy to make but looks totally professional. Bottoms up! 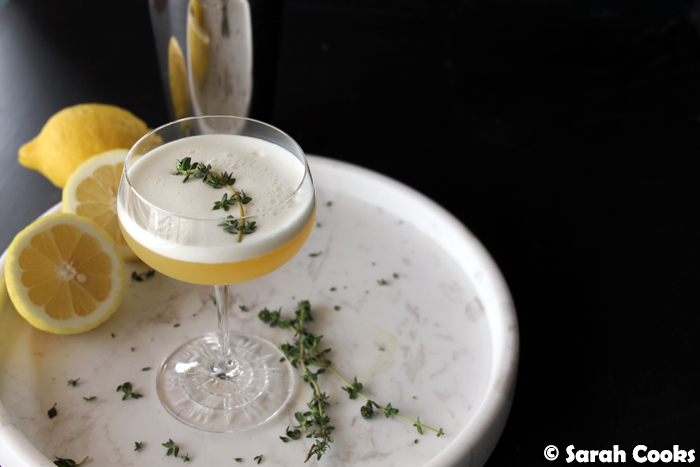 And that's exactly what happened with this lemon and thyme gin sour. For my most recent round with Prahran Market's The A-Team, I was given some organic lemons from Gippsland. I earmarked some for lemon curd and a dessert (recipe to come! ), and with the remaining lemons Sandra whipped up this fab cocktail! (You may also remember the vegetarian stuffed capsicums and the fennel, potato and smoked mozzarella gratin). It's a simple cocktail with accessible ingredients - save the obscure ingredients for the professionals who have a high turnover and can afford to use a drop or two of, say, cardamom bitters or fat-washed rum in each of the dozens (or hundreds?) of cocktails they make! 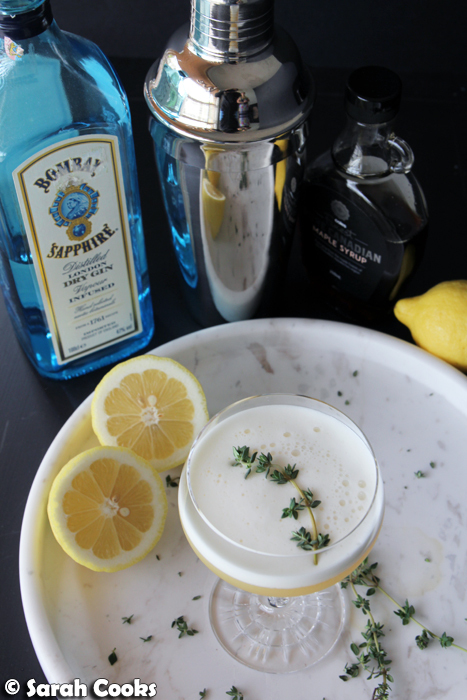 Here we've just got gin, lemon juice and a little maple syrup for sweetness, with a sprig of thyme for a mild herbal hit (smack it between your palms before adding it to the cocktail shaker to help release the aromatic oils), all shaken over ice with an egg white. I love the foamy deliciousness of egg white cocktails, but also I love how the easy addition makes home-made cocktails look so professional! (I'm also a big fan of these fancy new coupe glasses we bought). Shake it all up, strain it into a pretty glass, say cheers and drink! These sours are really refreshing and, well, sour. I think they go perfectly as a nice aperitif before a meal or as a general summer cocktail. Enjoy! (Responsibly). Place the lemon juice, gin, maple syrup, and egg white into a cocktail shaker. Smack one sprig of thyme to release the oils and add to the cocktail shaker. Add ice to the shaker and place the lid on. Shake vigorously. Strain into a coupe glass and garnish with the remaining sprig of thyme. We've recently added a home bar to our place and I totally agree, though the homemade cocktails are cheaper and easier they look completely professional! Surely trying this one Sarah!